The Christon from Mendip Stoves is a sleek inset stove suitable for any home due to its many sizes and frame choices. Available in three sizes 600, 700 and the impressive 900 Flatline the Christon adds a modern chic look to your living area. 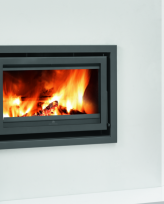 The choice of 3 or 4 sided frames give you the versatility to have the stove installed straight into the Chimney breast or have it installed onto a glass hearth. What sets the Christon apart from the rest of the Mendip range is its chic contemporary charm, this and the spectacular fire view that can be compared to a window of fire, bringing the open fire sensation straight into your home.